If you were a kid growing up in the 1990s then you would have certainly been a fan of the Transformers cartoon that told the story of an ongoing war between an alien race consisting of the “evil” Decepticons and the “good guys” the Autobots. Movie director Michael Bay ensured that a new generation was treated to the Transformers franchise with the release of three very successful films. Wagerworks also introduced the popular franchise to the online slots platform with their release of Transformers – Ultimate Payback slot in 2009. Back then, Wagerworks was working with online slot developer IGT but Wagerworks have since moved onto a partnership deal with Scientific Games leaving IGT to release their own slot based on the Transformers franchise. Transformers – Battle for Cybertron immediately looks and feels much more of an accomplished slot than its Wagerworks predecessor. The graphics are much slicker and the feel of the slot is smoother. This 5 reel, 40 payline slot follows in the footsteps of some strong branded slots that have already been released by IGT including the game show-inspired 100,000 Pyramid, the unmistakable Elvis – A Little More Action and the well-renowned Ghostbusters slot. If you’re looking for a bargain basement slot then you might not want to carry out your slots action right here. The minimum bet you can place is 60p and the maximum bet per spin is £600 so this one is more for the big fish. This slot comes with a FreeFall Symbols feature that is an attractive feature on any slot. This gives you a fantastic opportunity to win time and time again on each spin as symbols fall down to replace other symbols and completing more winning combinations without you having to spin the reels. The symbols disappear when they complete a winning combination and the symbols will keep disappearing to be replaced by new symbols until no winning combinations are completed. There are also five Mystery Bonus features on this slot. Each one is triggered randomly and keeps you on your toes during each spin. I know, as if the FreeFalls Symbols feature carnage wasn’t enough to keep your wits about you! The Optimus Prime feature will destroy all Decepticon symbols on the reels. These come in the form of the Megatron, Shockwave and Decepticon Logo symbols. The Megatron feature destroys all the Autobots symbols. These consist of the Optimus Prime, Bumblebee and Autobots Logo symbols. The Grimlock feature burns away a random selection of symbols on the reels and this is the same for the Shockwave feature. When the symbols disappear, the FreeFalls Symbols feature enters the fray again and new symbols drop down from above to replace those that have been eradicated. Ratchet will also randomly pop up for his feature when you hit two Bonus symbols across the reels. He will turn a random symbol into a third Bonus symbol so you can trigger the free spins bonus round. Speaking of the free spins bonus round, this is where the real fun begins. You can trigger this by hitting three Bonus symbols on reels 1, 3 and 5 or hitting two Bonus symbols and randomly triggering the Ratchet feature to give you a third Bonus symbol as mentioned above. 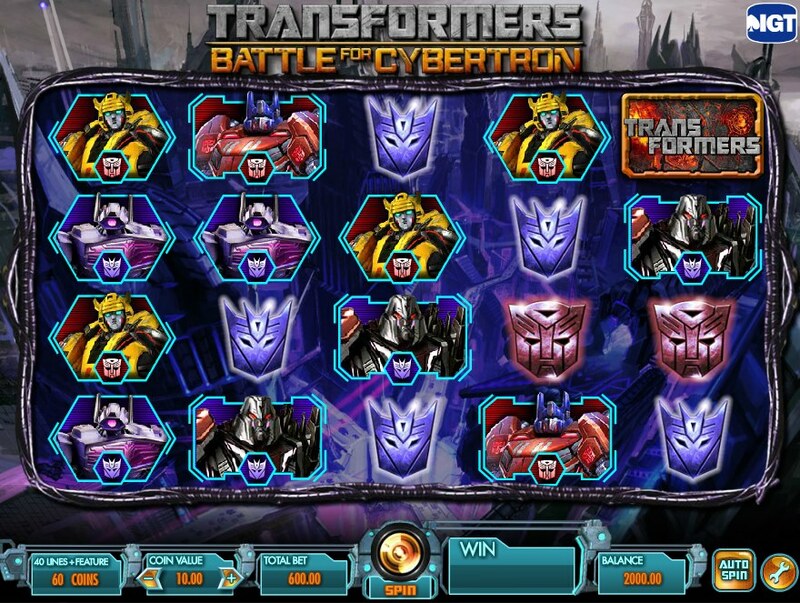 In this free spins bonus round, you have the choice of choosing one of the four main characters from Transformers. Each character offers you a varying range of free spins and multipliers. 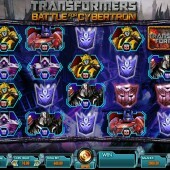 If you choose Megatron you will get 5 free spins and a 8x-10x multiplier. If you select Optimus Prime then you will receive 8 free spins with a 4x -10x multiplier. If you opt for Shockwave then you will be rewarded with 12 free spins and a multiplier value between 3x and 5x. If you decide to pick Bumblebee then you will be awarded with 15 free spins with a 2x – 4x multiplier. The multiplier value is chosen randomly. This slot is great for anyone that loved the Transformers as a kid. The Wagerworks version might have used the graphics and imagery from the original cartoon series but this new IGT version feels more polished using the imagery and characters from the movie franchise. The wealth of choice in the free spins bonus round giving you the chance to select how many free spins and the range of multiplier values you can win is a nice touch and this chance to choose your own bonus gives the slot the flexibility that is present in the Playtech Marvel slots such as the popular Fantastic Four slot and the recently released The Avengers slot. Personally, I wasn’t that big a fan of the Wagerworks Transformers slot but IGT have really delivered on this release in my opinion. Well worth checking out!